Given the evidence from Framingham it’s not an unreasonable hypothesis. Though it’s important to remember that the lipid hypothesis is just a hypothesis, an educated guess of what may happen when you lower someone’s cholesterol. 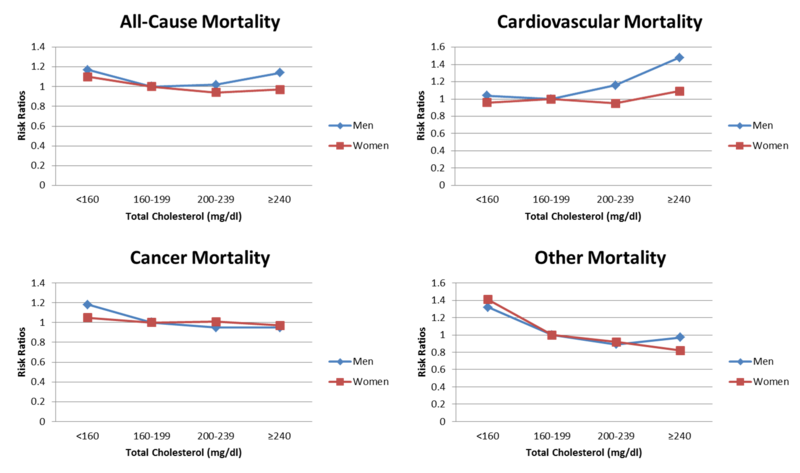 If the relationship between cholesterol and CHD remains consistent, things that lower cholesterol will still need to be tested to see whether they actually reduce events of coronary heart disease (as correlation doesn’t prove causation). Total cholesterol was the only measurement of blood lipids to begin with and continues to be the most common risk factor that is looked at for CVD. But we shouldn’t just look at associations between cholesterol and CVD. If the aim of reducing CVD events is to live longer than we should also look at the relationship between cholesterol and all-cause mortality as well. Of the studies I would put more weight in the first one as the second one looks at only a small section of the population and the third is subject to more confounders (there are many differences between countries). 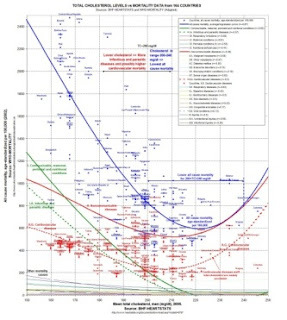 In summary, the relationship between total cholesterol and CVD is generally positive, whereas the relationship between total cholesterol and all-cause mortality seems to follow a U-shaped curve where cholesterol levels between 160-239 mg/dl (4.2-6.3 mmol/l) are associated with lower mortality. This is because low cholesterol is associated with a higher cancer and other causes of mortality in the first study and infectious disease in the third. 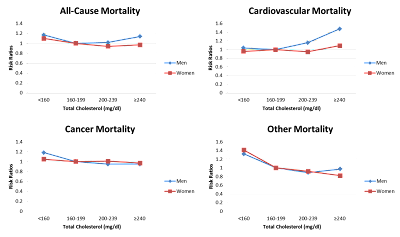 Based on this data, high cholesterol should be defined as > 240 mg/dl (> 6.3 mmol/l), but even still, the increased risk at this 'high' cholesterol level is quite modest. 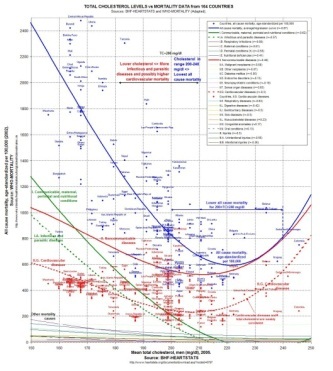 These graphs certainly don't support the view that the lower your cholesterol, the better. These results are observational, so they are likely subject to confounding variables and can't be used alone to determine causality. Confounders that may affect the low cholesterol-disease relationship include the disease process (like cancer) actively lowering cholesterol and statin use to lower cholesterol in high risk people or in secondary prevention. So some of the least healthy people may have some of the lowest cholesterol levels perhaps for no other reason than the drugs. Confounders that may affect the high cholesterol-disease relationship include: (1) familial hypercholesterolemia which is categorised as > 240 mg/dl even through their cholesterol levels are more like 300-400 mg/dl; (2) people with ApoE4 polymorphisms because ApoE4 increases cholesterol levels but also increases oxidative stress and is a risk factor for several metabolic diseases; (3) and again, other disease states like hypothyroidism and insulin resistance that increase cholesterol, but also impair homeostasis. Is Total Cholesterol Really a Major Factor? The results below come from the HUNT study. I'm showing it because unlike the three, this one has error bars and the point of the error bars is to show the variation in each group, in this case the variation in a certain cholesterol range and mortality. 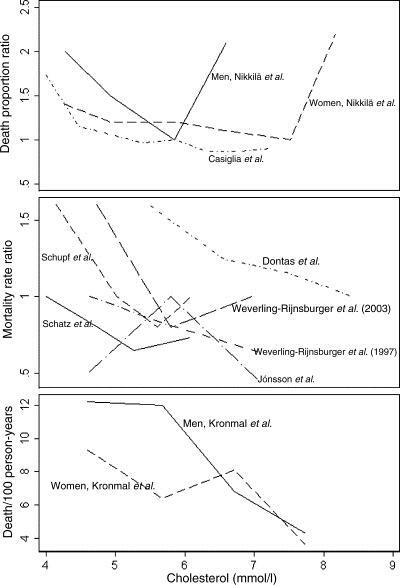 As you can see there is enormous variation within each group, suggesting that there are a variety of other factors, not necessarily well correlated with cholesterol, that affect mortality. An interesting study looked at a family tree that included people with the familial hypercholesterolemia (FH). People with FH have a gene mutation in the LDL receptor, resulting in worse clearance and very high cholesterol (300-400 mg/dl). 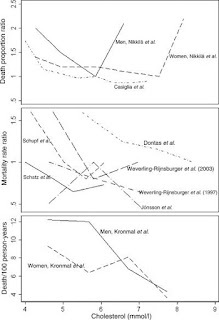 They found that people with FH were likely to have lower mortality prior in the 19th century, but higher mortality in the 20th centuary. While this isn't particularly strong evidence, it does raise some questions. Was FH a beneficial mutation (or at least not harmful) to have prior to the 20th century? If FH is such deleterious mutation (with regards to CVD) (as most people say it is), how come it hasn’t been strongly selected against and is still around (seeing as the increase in CVD during the 20th century and the apparent absence of CVD in hunter-gatherers can’t be explained by ‘people live longer now’) . 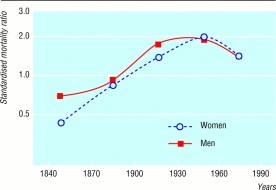 And finally, what changed in the 20th centuary to increase their mortality? Some explanations include hydrogenated vegetable oils, food refining and smoking, all of which increased during the early 20th century. (2) The Proper Use of the Term "Lipid Hypothesis"